Ade Adepitan MBE is a British television presenter and elite wheelchair basketball player who is available as a Paralympic speaker through Champions. Having survived polio as a youngster, he went on to compete at wheelchair basketball at an international level and is an instantly recognisable sports personality, having appeared in the high profile “Hip-Hop” idents for BBC1 and presented BBC’s daily X-Change programme for five years. Ade represented Great Britain at the 2004 Olympics in Athens, where the team won Olympic Bronze, and at Sydney 2000, in addition to competing in the European Championships, winning silver, and the World Championships, taking the gold medal. Ade is a truly inspiring speaker because of the hardship that he has faced, and how he overcame it to achieve great things and live his dream. Proving he is as versatile on screen as he is on the court, the Paralympic speaker has also appeared in serious documentaries Britain on Benefits and Cuba, Basketball and Betrayal. However, it is his regular appearances on Channel 5’s NBA coverage and his sports commentary at the 2008 Beijing Paralympics that have sealed Ade’s reputation as a top sports commentator. Ade’s energy, enthusiasm and philanthropism saw him become an ambassador for the NSPCC as well as a patron for Go Kids Go. He was also an ambassador for London’s 2012 Olympic bid and now sits on the advisory board of LOCOG. Drawing upon his own bravery, courage and determination, Ade is the perfect candidate for a Paralympic speaker, delivering talks at sporting conferences, events and charity fundraisers. With the ability to eloquently address adversity, peak performance and teamwork, Ade engages a crowded room with ease. 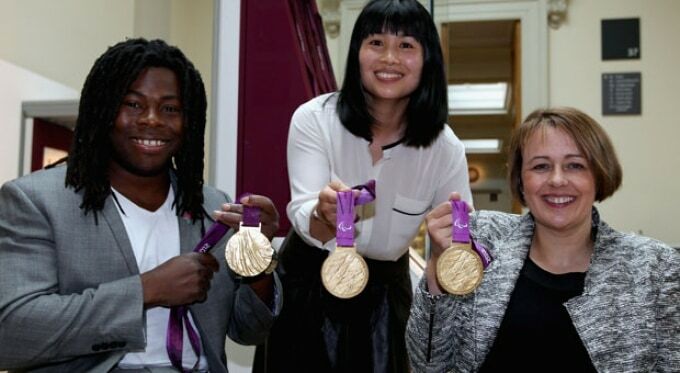 To book Ade Adepitan MBE as an after dinner speaker or programme presenter with Champions Olympic Speakers, simply fill in our online form today or call us on +44 1509 85 29 27.